My daughter has already reserved section and schedule for the first term of the new school year through Online Self-Enrollment System today. From the same website, we were able to find out the amount that we were supposed to pay. While we’re expecting an increase in tuition fee, we have no idea that the hike would be that big. It’s a good thing that my daughter is entitled to a 50 percent discount. As a parent, do you feel the burden of tuition fee hike this year? 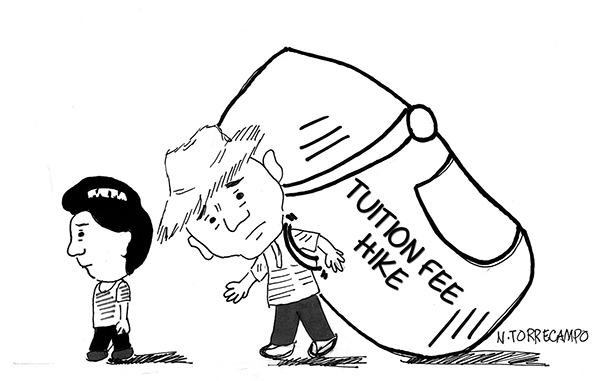 This entry was posted in Editorial Cartoon and tagged editorial cartoon tuition fee hike, parent carrying the burden of tuition fee increase cartoon on May 26, 2014 by Yami.